Don Taapken was born in 1942 in Illinois. He enlisted in the U.S. Army on October 13, 1960, and completed basic training at Fort Leonard Wood, Missouri, in December 1960. Pvt Taapken next attended Infantry training at Fort Benning, Georgia, from January to March 1961, followed by service as a Squad Leader with Company D, 1st Brigade of the 26th Infantry Regiment in West Germany from March 1961 to February 1963. He served as a Squad Leader with Company S, 3rd Battalion of the 187th Infantry Regiment at Fort Benning from February 1963 to January 1964, and then as Direct Fire Crewman with Company D, 1st Battalion of the 188th Infantry Regiment at Fort Benning from January 1964 to June 1965. Sgt Taapken next served as a Direct Fire Crewman with Company D, 1st Battalion of the 8th Cavalry Regiment in South Vietnam from July 1965 to July 1966, followed by service as a Heavy Weapons Infantryman with Troop E, 1st Cavalry Regiment of the 11th Infantry Brigade in Hawaii from July 1966 to June 1967. His next assignment was as a Platoon Sergeant with Company A, Company C, and then Headquarters Company, 1st Battalion of the 8th Cavalry Regiment in South Vietnam from June 1967 to May 1968, and then as a Senior Instructor with the 4th Training Support Brigade at Fort Benning from July 1968 to May 1969. Sgt Taapken served as a Heavy Weapons Leader with the 46th Special Forces Company in Thailand from June 1969 to June 1970, and then served as a Heavy Weapons Leader with Company C, 6th Special Forces Group, and then Company B, 2nd Battalion, 5th Special Forces Group, at Fort Bragg from July 1970 to May 1972. 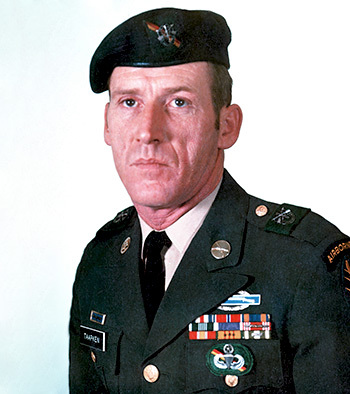 During this time he served on the Security Element of the Greenleaf Support Group during the Son Tay Raid, a clandestine mission to rescue American Prisoners of War held in North Vietnam on November 21, 1970. He was then assigned as a Procurement NCO with the John F. Kennedy Special Warfare Center and with the 4th Student Training Support Brigade at Fort Bragg from May 1972 to September 1974. His next assignment was as First Sergeant of 1st Brigade, 24th Infantry Division at Fort Stewart, Georgia, from October 1974 to November 1976, followed by service as First Sergeant of Company A, 2nd Battalion of the 19th Infantry Regiment at Fort Stewart from November 1976 to September 1977. He served as Operations Sergeant of Company A, 1st Battalion of the 10th Special Forces Group in West Germany from October 1977 to June 1979, and then as Command Sergeant Major of Company A, 1st Battalion of the 10th Special Forces Group from July 1979 to May 1980. After attending the U.S. Army Sergeants Major Academy at Fort Bliss, Texas, CSM Taapken served as Chief Operations NCO with Headquarters Command at Fort Benning from February to October 1981, followed by service as Command Sergeant Major of 3rd Battalion, 7th Infantry Regiment at Fort Benning from October 1981 until his retirement from the Army on November 1, 1983. For gallantry in action on 21 November 1970 as a member of an all-volunteer joint U.S. Army and Air Force raiding force in the Joint Chiefs of Staff-directed heliborne assault mission to rescue United States military personnel held as prisoners of war at Son Tay prison in North Vietnam. This valiant effort was motivated by deep compassion for his imprisoned fellow men-at-arms, and by a strong sense of military duty and national pride. On arrival in the target area Sergeant Taapken, without regard for his personal safety, exposed himself to continuous hostile enemy fire to move to a position where he could effectively employ his M-79 grenade launcher. This action protected the other members of his platoon while they were involved in house-clearing actions. He repeatedly distinguished himself by highly valorous actions in eliminating enemy resistance during the house-clearing operations. His swift and positive combat actions, together with his courageous execution of his assignment, insured successful completion of the mission without the loss of a single life. Sergeant Taapken's daring skill, extraordinary heroism against an armed hostile force, and extreme devotion to duty are in keeping with the highest traditions of the military service and reflect great credit on himself and the United States Army.